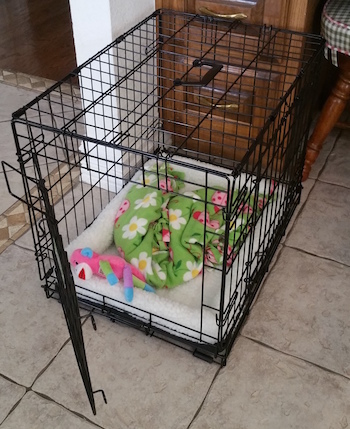 Generally speaking, it’s nice for your dog to have something comfy to lay and sleep on when in their crate. Now, what exactly that something is will depend on your dog … particularly their teeth and their bladder. With young puppies, whatever you put in (if anything) should ideally be both chew-proof and waterproof. Easily washable is another nice feature, too. For adult dogs the chew-proof aspect typically isn’t as important, and ideally the waterproof one isn’t either. But, of course, some "mature" dogs are more adolescent-like than others … that’s right, I’m looking at you Labs! With senior dogs you typically don’t have to worry about the “chew-proofness” of their crate bedding, but the waterproof feature may become more important again and the “orthopedic supporting” properties of the bedding may, too. The waterproof and relatively chew-resistant Canine Ballistics TUFF crate pad can be a good option for puppies that aren’t too strong or determined of chewers, and for most adult dogs. The Hugglefleece Dog Mat would be another good option for these dogs. With either mat, be sure to pick the right size that fits your crate. 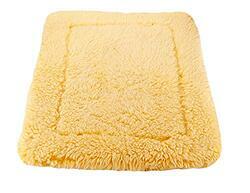 The Brindle memory foam bed is super plush and comfortable, and has a removable and washable cover. It’s not very chew-proof though, so likely not a great option for a mouthy puppy or even a chew-happy adult dog. But the comfort and support of the bed itself often makes it a great option for truly mature adult dog and most seniors. The Canine Ballistics “Cujo Cot” is one of the best options out there for puppies, adult dogs, and senior dogs, alike (though some smaller senior dogs may have difficulty stepping onto and off of it). It’s super durable, waterproof, and the porous nature of the bed allows water or urine to pass through to the crate floor, preventing your piddly puppy or leaky senior dog from laying in their own accidents. You can put a pee pad or two underneath it to capture the leaks. The scent of you may be comforting for your pup. However, whether or not you should leave one of your t-shirts (or another item of your clothing) in your dog’s crate, again … very much depends on your dog. If they’re likely to chew it up or eat it, then that’d be a big ol’ “no” … not worth the cost and stress of the surgery they’ll then need to retrieve the article of clothing. However, if they’re not likely to chew and eat it, then yes, leaving your t-shirt in your pup’s crate can be a nice way to leave “a little piece of you” behind when you can’t actually be there yourself. Molly Mutt makes a great stuffable duvet that you can use to cover an existing bed or stuff with your clothes with this stuff sack. It makes for an easy, washable bedding solution and is a great use for old sheets and clothing. There's also a waterproof liner. And you can boost the “reassuring power” of your clothing by giving it a quick spritz with the Adaptil dog-calming pheromone (just a spritz or two does the trick, more is definitely not better when it comes to pheromones). The question of food and water in a dog’s crate is a little more straightforward. Generally speaking, leaving food and water in your dog’s crate isn’t recommended. This is mostly from both a spillage/mess standpoint and also a potty break one. Food and water bowls left in the crate are likely to get tipped or knocked over, and if a dog has free access to food and water throughout their day in the crate it’s more likely that they’ll have need for more bathroom breaks throughout their day, too. Now, if you’ve got a dog that has a medical condition where they shouldn’t ever be without free access to fresh drinking water due to increased risk of, or complications from, dehydration – like diabetes insipidus (“water diabetes”), diabetes mellitus (“sugar diabetes”), kidney disease, Addison’s disease, or another – or if they’re on medications that make them more prone to dehydration (e.g., Lasix or other diuretics, steroids), then you’ll need to leave them with water. In these cases go with a sturdy, tip-proof bowl (either free-standing or one that attaches to the crate bars) or a lickable water bottle that attaches to the crate bars. Tip-proof bowl: Many bowls say they’re spill-proof, but this Ray Allen bowl really does live up to the billing. One knock is that it can be hard to open to clean. But this is easily solved by soaking the bowl in hot water to soften it up a bit before trying to remove the rim. 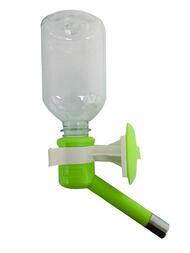 After several rounds of this and with more use it’ll become easier for you to do. 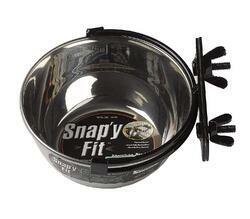 Bowl that clips to crate: These bowls are super sturdy, for some perhaps even too much so. The bowls are held very snugly in the clip, which is great to prevent it from spilling when a dog paws at or pounces on it, but may also make it a little difficult for you to remove. Once you get the hang of it though, these really are the best crate-clip bowls. Lickable water bottle: This crate water bottle is great because it’s BPA-free AND attaches to the outside of the crate, making it far less likely that your dog will chew and destroy it. If the bottle it comes with isn’t big enough for your dog, the valve also attaches to a variety of other sized PET bottles, like empty soda bottles. Most dogs will take to a lickable water bottle quickly if you spread a little bit of peanut butter, regular butter, or coconut oil on the drinking nozzle to get them to start licking it. As they do so, they’ll realize that water comes out as they lick. It may take a few times of applying the peanut butter, etc., but many dogs then pick it up pretty quickly from there. Some other notes about food and crates: If you want to get your dog to really love their crate — and who doesn’t — when mealtime comes, feed your dog their meals in their crate (you can leave the door open). Ideally in a puzzle feeder, but even in their regular bowl, this will help your dog form wonderful, positive associations with their crate and help them do so more quickly. Also, whenever you’re walking by your dog’s crate with your dog following close behind, throw a few treats into their crate for them to go get. Again, this will help them associate the crate with awesomeness! Unless you want your dog to be bored out of their mind, and potentially destructive as a result, it’s a good idea to include some toys in their crate while you’re out. Of course, when it comes to “crate toys,” not all are created equal, not all are safe, and not every dog is ready for the privilege of having toys left in their crate unobserved. You know your dog and situation best, but for those dogs that can handle the responsibility, below are the types of toys you should consider, and why. When chosen correctly, puzzle feeders are often sturdy enough to live up to a little chewing, yet pliable enough so as not to pose a fracture risk for your dog’s teeth. Because they can (and should be) filled with food and/or treats, these types of toys are excellent for entertaining your dog and their brain, sometimes even exhaustingly so, while they’re spending their time in the crate. They needn’t be super full (again, refer to the caution above about leaving a bunch of food in your dog’s crate) and they needn’t even be super challenging, both just enough to keep your dog entertained while you’re gone. Below are our favorite puzzle feeder toys to keep dogs entertained while in their crate. As with all toys, make sure to monitor your dog as they play with them the first few times to ensure that they play with them safely, and also to ensure that the puzzle isn’t so challenging that your dog gets frustrated by not being able to figure it out. That’s definitely not a fun situation! 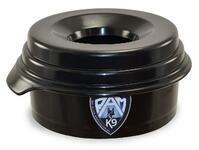 Get more tips about choosing the best interactive toys and puzzle feeders for your dog. WestPaw “Toppl”: Get a couple different sizes, as they can fit within each other, allowing you to adjust the difficulty and fun for your dog. PRO TIP: When practical and possible, provide more than one puzzle feeder toy for your dog in their crate and have a steady supply of puzzle feeders that you can keep filled, frozen, and rotated to keep things fresh for your dog and their brain. See which toys you shouldn’t leave in your dog’s crate, and why. Some dogs are “mature” enough to have a stuffie toy or two in their crate with them while you’re out, but not all are. If you’ve got a serious chewer and “destroyer” on your hands, there really aren’t any stuffie toys that would be good to keep in their crate while you’re gone. If, on the other hand, you’ve got an “inhaler” or “nibbler,” then there just may be a few stuffies that are just right to provide them with the comfort and entertainment you’re looking for. Check out our Preventive Vet favorite dog stuffie toys below, and check out this article to help you determine your dog’s “chewsonality” and the types of toys that are generally going to be best for them. HuggleHounds Corduroy Knottie dog toys: octopus, fox, and many other styles make great soft, fun, and adorable toys for dogs. They’re great for fetch and tug, too. NOT so great as crate toys for chewy-happy dogs. 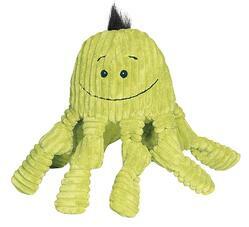 Tuffy brand dog toys: designed for interactive play (tug, fetch, etc.) but not as chew toys, these tough (and adorable) toys are often fine as crate toys for NON-CHEW HAPPY dogs. Here’s their adorable, chew-scale 8 lamb toy (great for dogs counting sheep) and also their chew-scale 7 dinosaur toy. 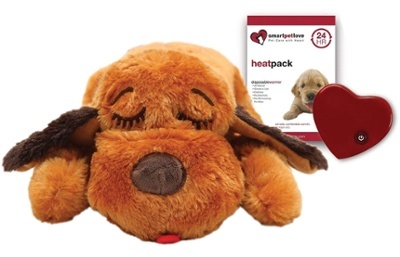 A special situation for NON-CHEW HAPPY puppies or adopted adult dogs just settling into their new home, or even for those dogs that just need a little extra comfort while they rest in their crate … the Snuggle Puppy is a comfy stuffed toy that provides warmth and a recorded heartbeat, both of which can help relieve or lessen anxiety and be comforting to a lot of dogs. Again, don’t use with aggressive chewers, as the AAA batteries and the disposable heat source, as well as the stuffing, can cause problems for dogs that chew or swallow them. Collars & tags: Dogs should ideally “go naked” in their kennel. This is because dangling dog tags and even collars can get caught in crate bars, creating a strangulation hazard for dogs. If you do keep a collar and tags on your dog in their crate, go with a breakaway type safety collar and lay-flat dog ID tags. Electric and power cords: Since some mischievous dogs have been known to pull nearby electric cords and power cables into their crate and chew on them, best to take precautions to keep these shock hazards well away from your dog’s crate. Pets, not only have injured themselves, but have started fires! 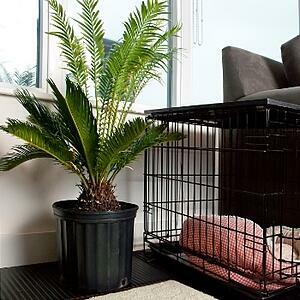 Poisonous plants: Since dog crates aren’t always the nicest things to look at, some people will try and pretty-up the area around (or on top of) their dog’s crate. This can be totally fine, just be sure that any plants or flowers you’re putting next to or on top of your dog’s crate aren’t likely to poison them should they decide to take a nibble. One of the most dangerous ones to watch out for is the beautiful—but dog-deadly — sago (inset photo shows what the toxic sago palm looks like). For a list of other plants and flowers hazardous to dogs, check out this great searchable list from our friends at ASPCA Animal Poison Control. Hot and Cold: To ensure your dog’s best comfort, it’s also important not to put their crate anywhere that it’ll get too much direct sunlight or anywhere that’s too drafty or right near your heating and cooling vents (or radiators, baseboards, or fireplaces). I hope this has helped you set up your dog’s crate as safely as possible. For everything else you need to know about crate training for dogs, including how to choose a crate and where to put it, check out Everything You Need to Know About Crate Training Your New Puppy or Adult Dog.